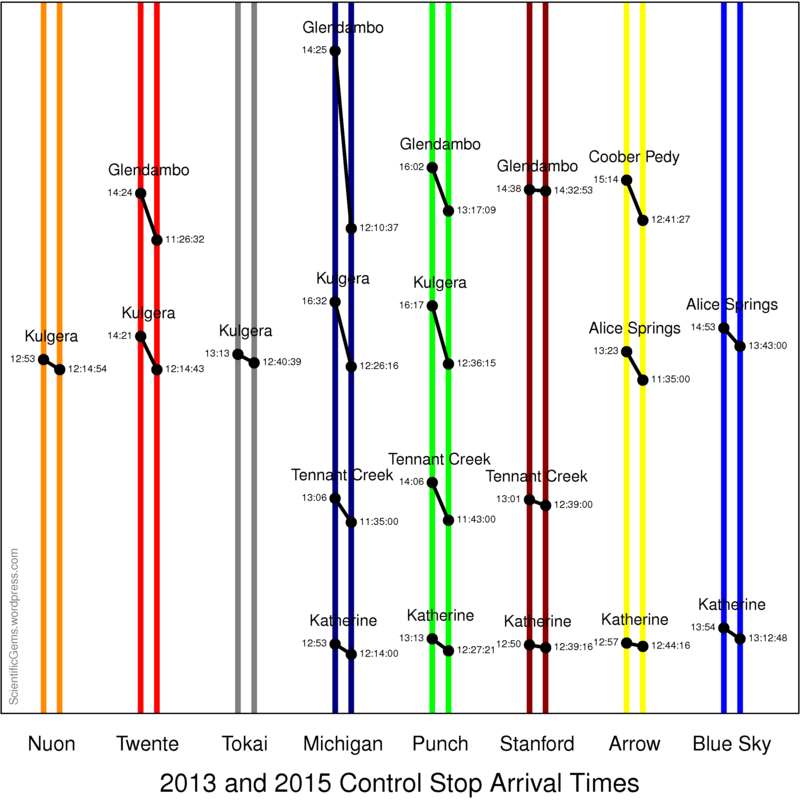 Here, updating an image I tweeted earlier, is a comparison of World Solar Challenge control stop arrival times. Elapsed time runs vertically upwards. 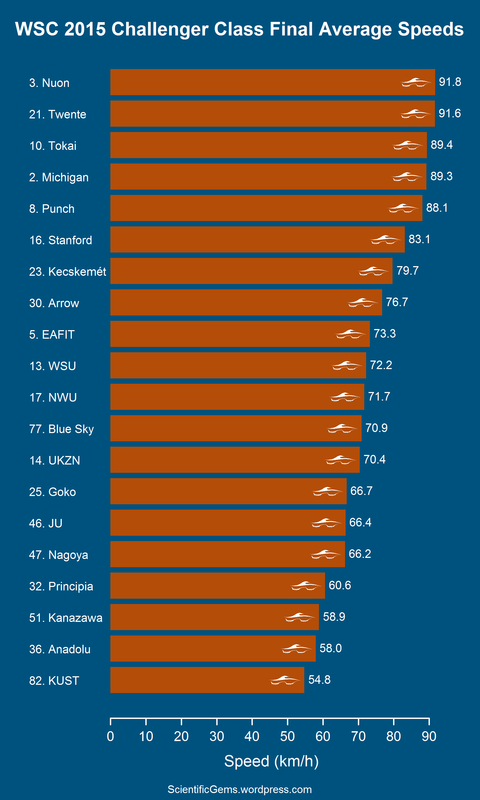 Twente, Michigan, and Punch are notable for running considerably faster this year. Direct comparison was somewhat difficult due to lack of data and various changes – for 2013 (leftmost bar of each pair) I used what data I still had, and for 2015 (rightmost bar of each pair) I used tweeted photographs of timing boards. There are three main (though closely related) branches of mathematics – the study of number, the study of shape, and the study of relationships. An interesting ethnomathematical example of the latter is the “skin group” system of the Lardil people of Mornington Island in Australia. Membership of a “skin group” implies a complex set of tribal obligations and taboos, but the most significant is that only certain kinds of marriages are permitted. Members of group 1 must marry people from group 2 (and vice versa), and similarly for the pairs 3/4, 5/6, and 7/8. All other marriages are considered to be incestuous. 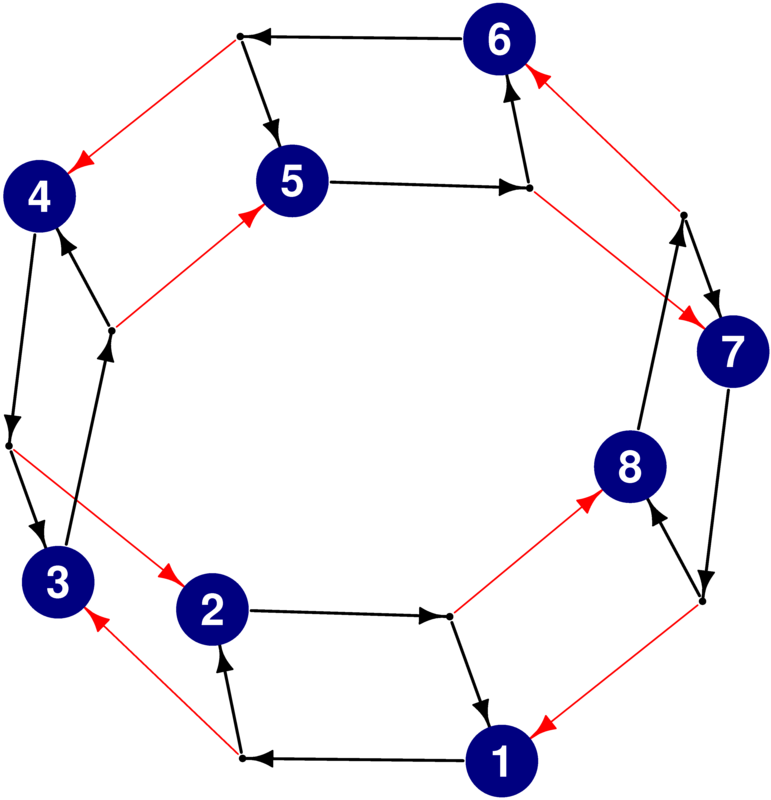 We can define two mathematical functions, the father-of function φ and the mother-of function μ, that map the “skin group” of a father or mother to the “skin group” that their children must have: φ(1) = 8, μ(1) = 3, φ(2) = 3, μ(2) = 8, etc. Following a single black arrow and then a red arrow (→→) gives the mother-of function μ, with μ(1) = 3, etc. It can be seen that this function has a four-generation cycle: μ(μ(μ(μ(x)))) = x or, as it is often expressed, μ4(x) = x. In other words, each person’s “skin group” is the same as that of their great-great-grandmother in the female line (the maternal grandmother of their maternal grandmother). Following a single black arrow backwards (from the head end) and then a red arrow (←→) gives the father-of function φ, with φ(1) = 8, etc. It can be seen that this function has a two-generation cycle: φ(φ(x)) = x or, as it is often expressed, φ2(x) = x. In other words, each person’s “skin group” is the same as that of their grandfather in the male line (their paternal grandfather). The combination of the two cycles makes the Lardil “skin group” system a very effective way of shuffling genes within a small population, thus avoiding inbreeding. It also highlights the fact that mathematics can be found in some surprising places. And there are even more patterns to be found in this example. Among others, σ(x) = φ(μ(x)). Also, μ(φ(μ(x))) = φ(x), which some readers may recognise as indicating a dihedral group. “I have been in the WSC business so long, now that it’s over I don’t know what to do with the rest of my life.” Probably that was the last of my WSC-related posts. Many other charts and web pages were produced during race coverage. In each case, R provided useful facilities for acquiring, visualising, and organising data. Generating HTML from R scripts and a database also proved very successful. In hindsight, virtually all blog posts should have been generated this way. 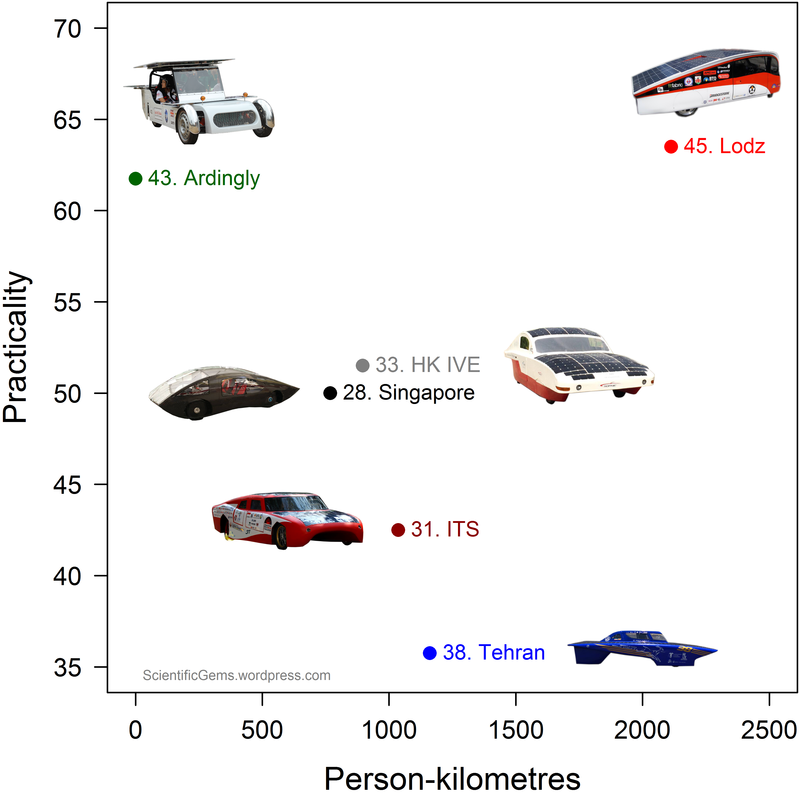 Following up on the World Solar Challenge official results, here are the six Cruisers that trailered, plotted by the two most meaningful numbers for such cars – person-kilometres and practicality. The lovely little car from Lodz is clearly the leader of this particular pack and thus, in my opinion, sixth Cruiser overall. I should also point out this great WSC dataviz by Tiffany Hu, and the superb WSC summary and retrospective by MostDece. 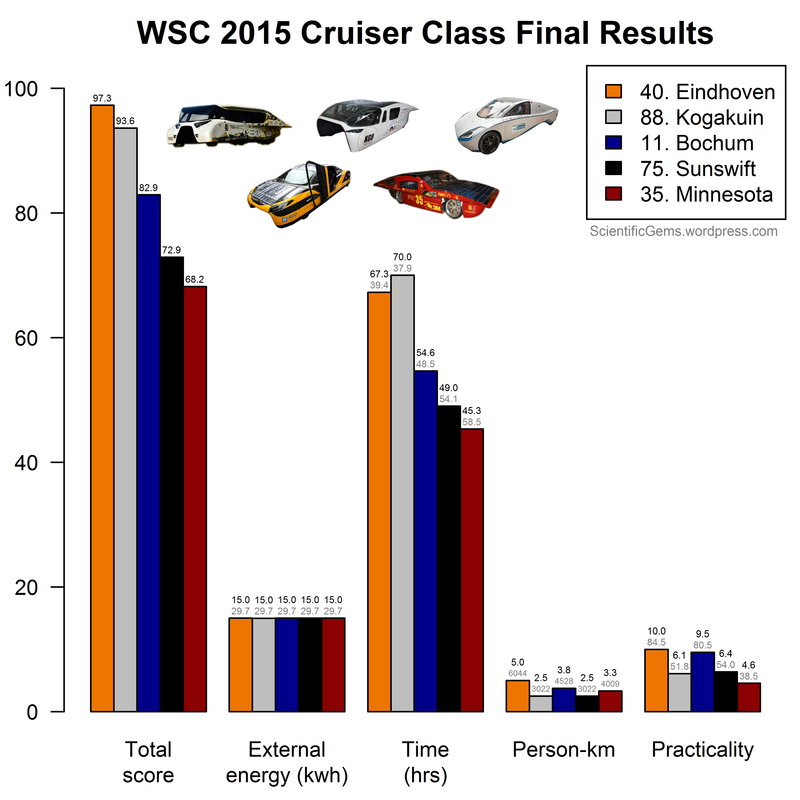 The World Solar Challenge has finally released official results of the race (for Challengers, Cruisers, and Adventure class), and the chart below shows the breakdown of scores for the top five Cruiser class cars. As in my 2013 version of this chart, each coloured left-hand-side bar is the sum of the other four bars with the same colour. The times used for scoring by the WSC are based, as far as I can see, on the time from Darwin to Adelaide (rather than to the so-called “end of timing” point) minus the waiting time at control stops and at Alice Springs. I suspect that Kogakuin might have won had they chosen not to recharge at Alice Springs (which would have slowed them down a little, but would have cost everybody else 7.5 points). As it was, Kogakuin’s speed advantage of 2.7 points almost exactly counterbalanced Eindhoven’s passenger advantage of 2.5 points, leaving practicality to decide the winner. 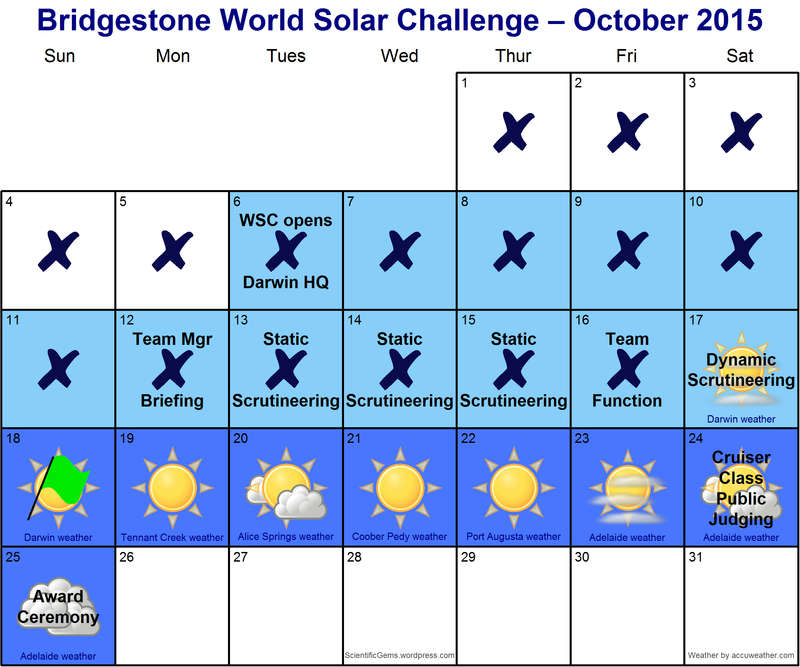 The World Solar Challenge has finally released official results of the race. The chart below shows average speeds for the 20 Challenger class cars that finished (a much greater proportion of finishers than last year!). The speeds are calculated by WSC based on time taken to the confusingly named “end of timing” point outside Adelaide (which was not actually the end of timing at all). Unfortunately end-of-race procedures were not well documented this year and (in the Cruiser class especially) some teams would probably have planned their strategy slightly differently if they had understood them better.